Surface-Mount EMI Filters - Corry Micronics, Inc. The Surface Mount EMI Filter family consists of two sizes and two circuit types. The 8 mm long filter offers capacitance values up to 4000 pF, and the 10 mm long filter offers capacitance values up to 8200 pF. Both sizes are offered in “C” and “Pi” type circuits. 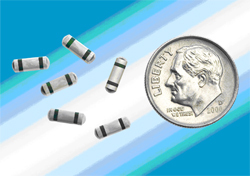 All Surface Mount EMI Filters offer a working voltage of 100 VDC, and current ratings of 10 Amps for “Pi” circuits and 20 Amps for “C” circuits. Custom capacitance values are available.